Facebook is trickier than it seems when it comes to advertising. Firstly, it's desperately hard to get anywhere without paying for Facebook Ads (but still possible as ALS Bucket Challenge proves). Secondly, even with the most precise targeting and amazing reach metrics, conversions from Facebook posts aren't always what you expect them to be. So how to make sure your marketing efforts and social media budget don't go wasted? I suggest learning from the best Facebook marketing examples. So in this post I've gathered brands, big and small, that do it right - specifically on Facebook. Other slogans include "What it feels like to get 48% less email", "What it feels like to be 32% more productive", and so on. See what they did there? 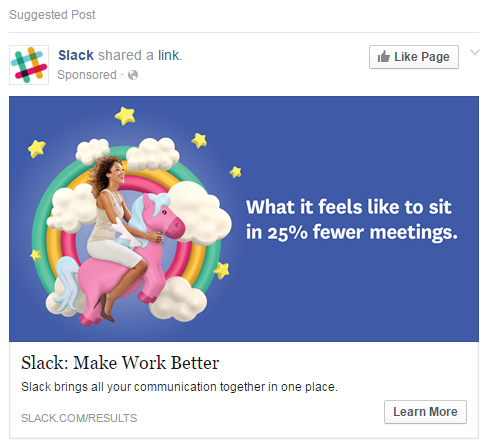 In their copy, Slack is solving the problems every member of their target audience has. Not just that, they are solving it with very precise numbers, which makes us feel that they know what they're doing - it's not just a whimsical promise. Now that you've appreciated the written part of the ad (including the one when they explain in short what the app is for), take a look at the image. It has everything: it's so bright it will catch your attention any time; it's positive, it promises fun in the tough world of work productivity. So really, it's not surprising Facebook drives conversions for Slack like crazy. As I said, we'll be going through different types of companies, and even if you feel like it's easy for Nike with their golden marketing budget, there's still a lot we can learn from them. 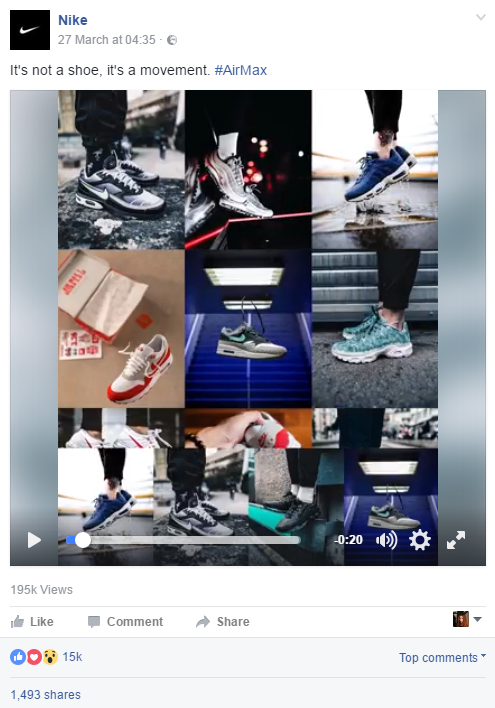 Nike is the absolute star of social media - the main brand page has around 28 million likes. That's bigger than a substantial number of countries... So what are their tactics? a) Almost every update lately is a video. Some videos are literally just a combination of photos (as the one above), but they are still posted as a video. Nike must know something! (Namely, that videos work better for Facebook). b) Nike has a separate Facebook page for many products. For example, Nike Football has more than 44 million likes. This tactic makes sense if you offer diverse products: some people might be interested only in the updates of one kind. For example, if you're selling electronics, you can have a specific page for the most popular product category - TVs, or headphones, or mobile phones. Your users will be much less likely to unsubscribe and convert. с) Nike has stressed different major points throughout their existence. 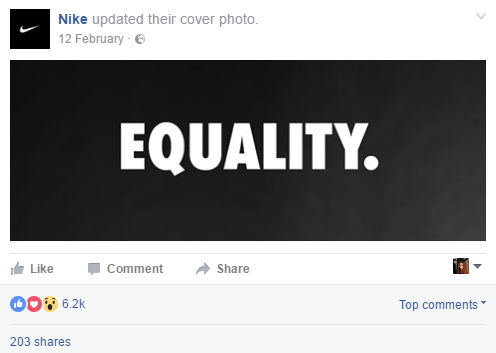 This year, their social media is all about equality, women's rights, underdogs, and so on. There is a good explanation for that - it's a trend. Nike keeps a very close look on every controversy that happens in their industry (or is vaguely connected to their industry), and makes a stand on it. As you can imagine, there's nothing like a controversial trendy topic (e.g., women wearing hijabs during Olympics) that produces hype and engagement. 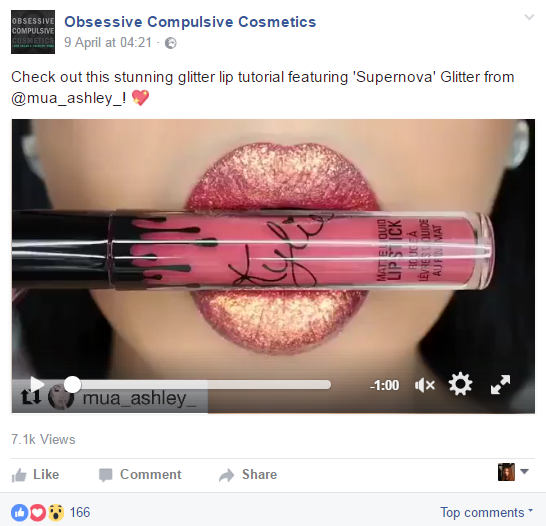 OCC, or obsessive-compulsive cosmetics, is a makeup brand whose Facebook page makes you want to buy everything they have. Well, at least it works for me and I'm the definition of their target audience. They've got more than 140 000 followers. Firstly, they obviously rock images - everything is bright and colorful. 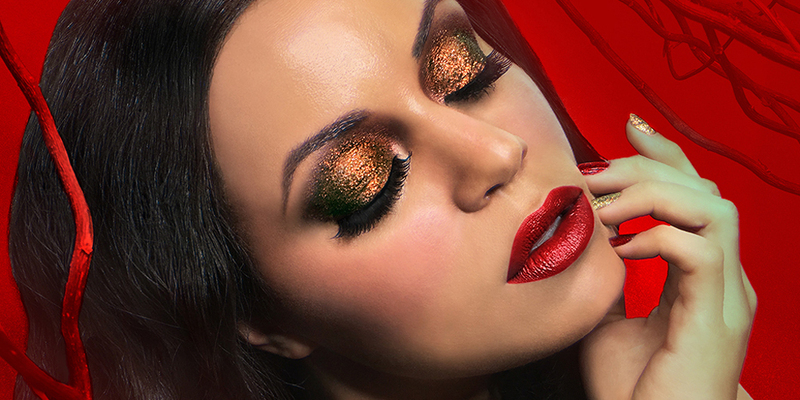 More importantly, as opposed to most makeup brands, OCC mostly posts real photos on Facebook. It's not a general stand - they still have regular photoshopped ads everywhere else, but Facebook is there to build trust and friendship. And they do it well by avoiding usual makeup marketing strategies. 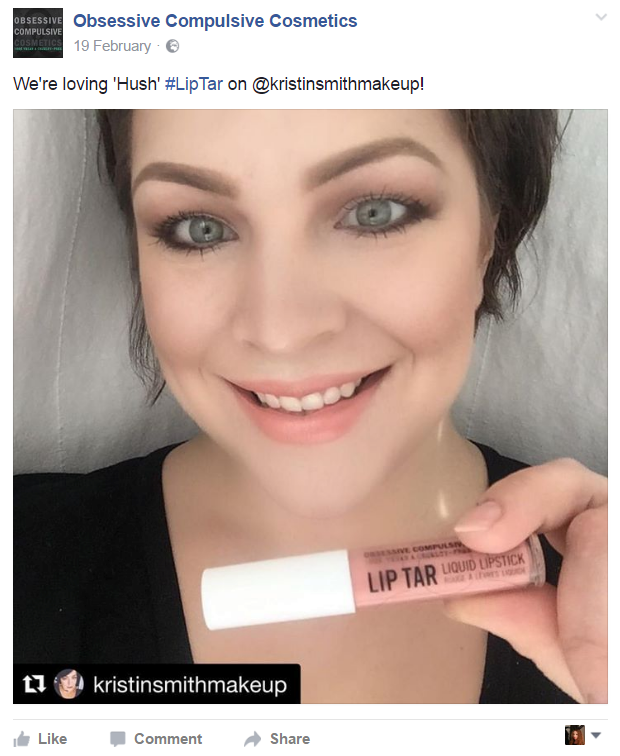 Another thing they do really well is making use of social media influencers. Most their photos on Facebook are reposts of people who have tried their makeup and mentioned OCC in their photo description. This way, they encourage influencers to do more, widen their audience, get native advertising, and basically kill a flock of birds with one stone. OCC doesn't ignore videos as well: they post tutorials or videos that show off their products. Another amazing thing that the company does on Facebook is showing off their competitor's products if they go along with their product. OCC prioritizes trustworthiness above everything else on social media, and they are making a success of it! It has around 100 000 likes and people actively engage with the content. Customers also seek support, praise and review the brand on their Facebook page, while Bitwell stuff provides "excellent" customer service according to most reviews. They also practice best "customer service on social media" practices, such as sending free accessories to some of their active social media customers. What's the secret and how can you use it with your own brand? The secret is knowing your target audience really well (OK maybe that one is not such a secret) and showing with every step of your Facebook marketing campaign that you understand your target audience. You know they enjoy speed and nature, and are absolutely tough. 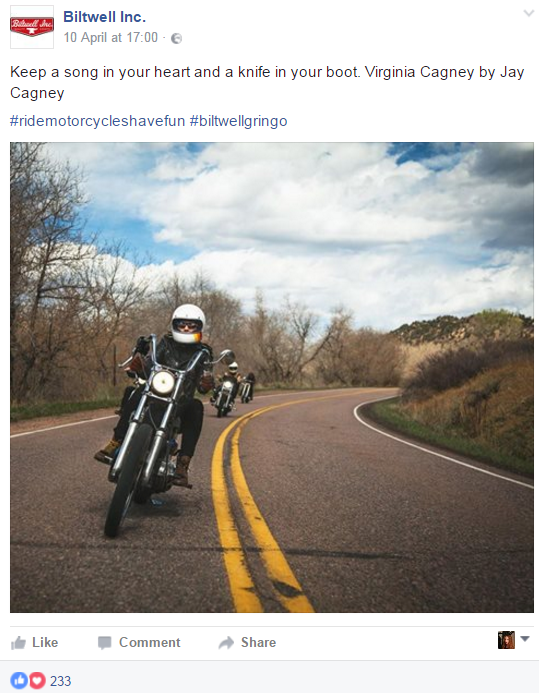 With every photo and with every quote Bitwell associates themselves with the freedom that is motorcycling for their customers, and makes sure they'll be the first to come to mind when the customers will need parts and accessories for their bikes. And finally, Red Bull. Their whole marketing strategy is impressive, and it's no less impressive on Facebook. Their page has 40 000 000 likes (and remember, it's a $2 energy drink, people aren't on their page eagerly awaiting a discount so that they can finally afford the product). How did they get there? Thing is, Red Bull isn't a company selling energy drinks - it's a publishing house. They are what everyone is wishing to become. 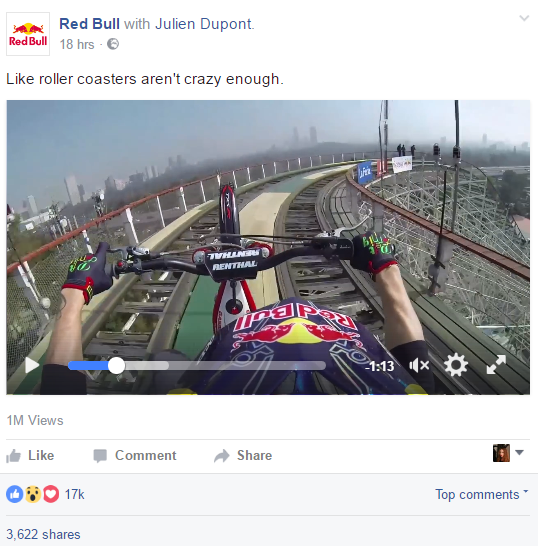 Red Bull creates content and makes people associate this content with their brand - much like Bitwell does. 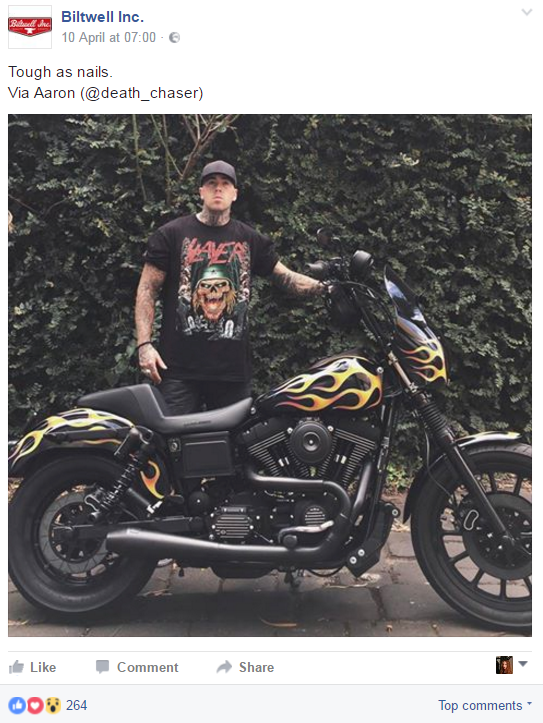 But while accessories for motorcycles have a lot to do with, well, motorcycles and the life they promise, Red Bull has not that much to do with sports. Let's face it: people either drink it in the university libraries to keep studying, or mix it with vodka on parties, or drink it not to fall asleep while driving after a hard day. So that's real Red Bull's target audience. But who are they? Students and active young adults. And what do they want to see on Facebook? Epic, exciting things. 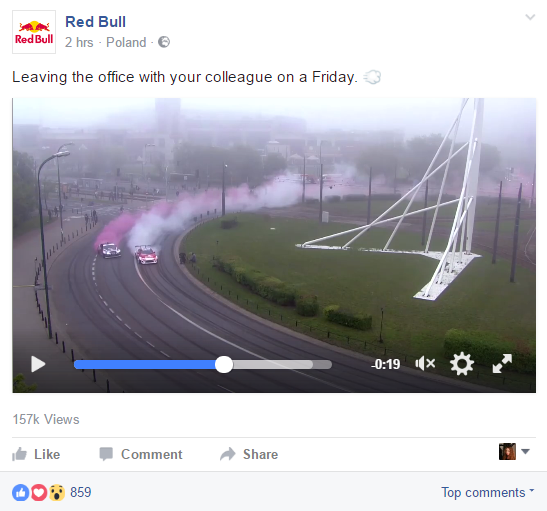 So on Red Bull's Facebook you won't see promotions, free cans, ads, or indeed anything that hints that you should go out there and buy some Red Bull. You'll see photos, videos and stories of people mountain biking, bungee-jumping, skiing and outrunning. The world of Red Bull is the world of extreme sports. You "Like" their Facebook just to see all the crazy things that people can do - if you're into that at all. And while watching a girl praying and then jumping from some enormous cliff and someone driving a motorbike on the roller-coaster, you get a vague feeling that some Red Bull would be nice. Feel inspired yet? Get out there and start a Facebook campaign that I'll include in the next list :) Don't forget colorful images, videos, consistency throughout the page, and powerful messages that show the kind of life that is behind your product. Good luck!